You know that euphoric feeling when you walk into a store, and you instantly feel comfortable and ready to shop? That’s what Target hopes you feel every time you walk through its red front doors. Whether you’re a first-time guest or you’ve been coming for years, it’s nice to know you can find everything you want easily and efficiently—all the while discovering new things along the way. Target’s store design—bright lights, wide aisles, branded signage—is a trait inherited from the Minnesota-based retailer’s heritage. 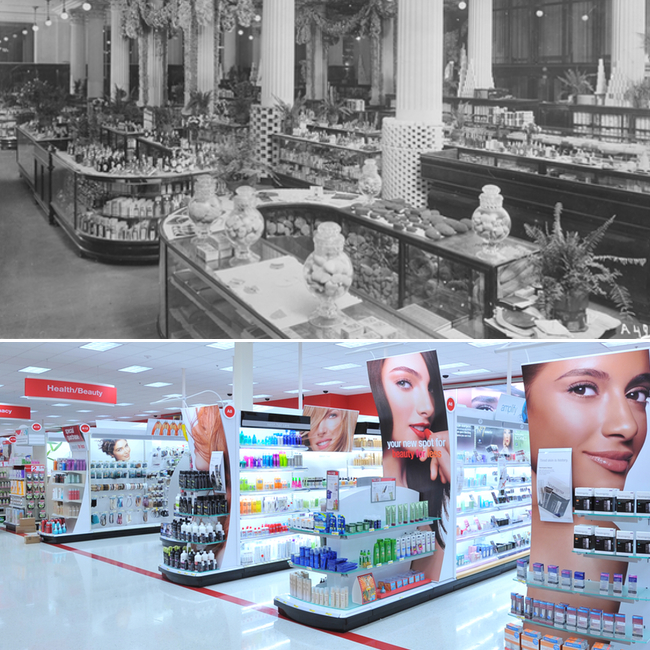 Dayton’s Department Store (Target’s predecessor) had the uncanny ability to understand its guests, anticipate their needs and deliver exceptional in-store experiences. That savviness included everything from presenting product in beautiful ways to incorporating research into store layout and lighting. 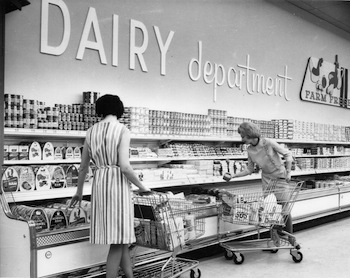 Products and price may have changed over the years, but Target’s thoughtful presentation and commitment to elevating the shopping experience has remained the same. 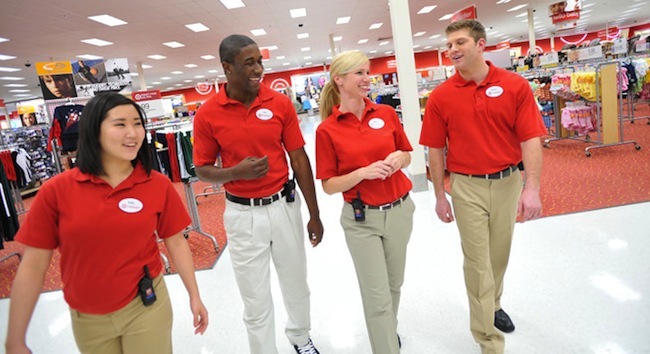 And, guests can shop with confidence knowing they will find the great values they’ve come to expect from Target. Below, Tina Schiel (Executive Vice President, Stores) and Nancy Devine (Senior Group Manager, Store Planning and Design) review the photo archives to show how Target’s present is formed by the past. In 1975, Target introduced the “racetrack” store prototype to ensure a consistent experience from store to store, no matter the location. One main aisle circles the store, with additional aisles running through the center and the perimeters, allowing for more space to display product. Target also debuted the first planogram, a “map” that helps store teams present clean, uncluttered merchandise displays. To create a consistent brand, Target streamlined the original Bullseye logo in 1968. Today, 96 percent of people recognize the iconic Bullseye, nudging out even Apple and the Nike swoosh. In every Target store, you’ll notice an effective use of the logo to differentiate aisles, departments and deals. The front door is the first (and often lasting) impression retailers can leave on guests. Target has strived to make shopping beauty products easy since 1962—prominent aisle placement has been key. Today, the beauty aisles are trimmed with bright lighting, instantly drawing your eye towards each shelf. Just last year, Target introduced beauty advisors in select stores to help guests navigate the newly redesigned beauty department. 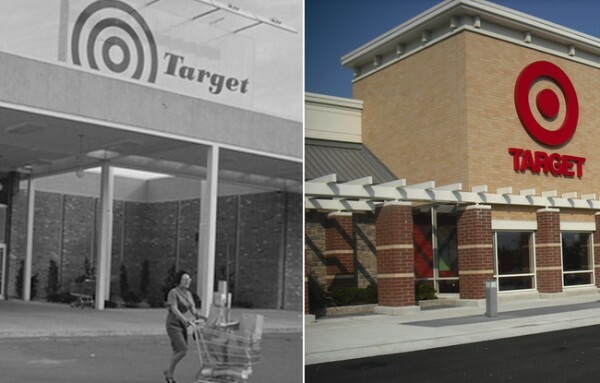 Since the first Target store opened in 1962, guests could shop for meals and more at what was a full service grocery store. But by 1980, Target left the grocery business. 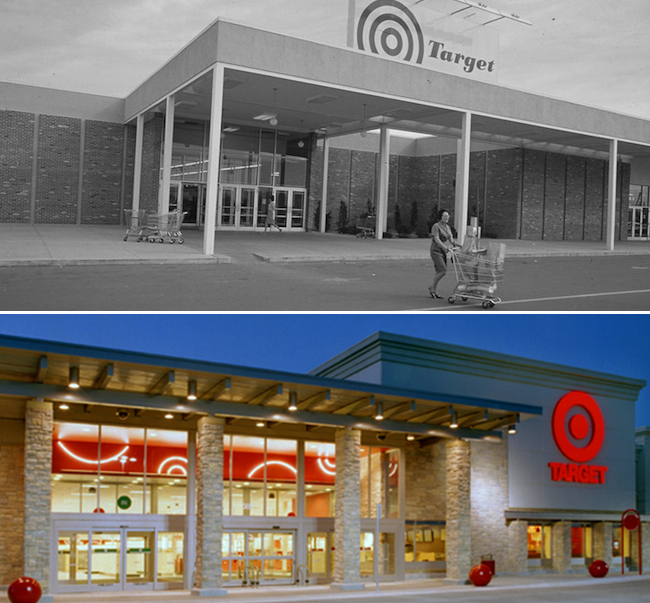 Fifteen years later, the first SuperTarget opened in Omaha, Neb. and featured a new section with fresh produce, dairy and meat. 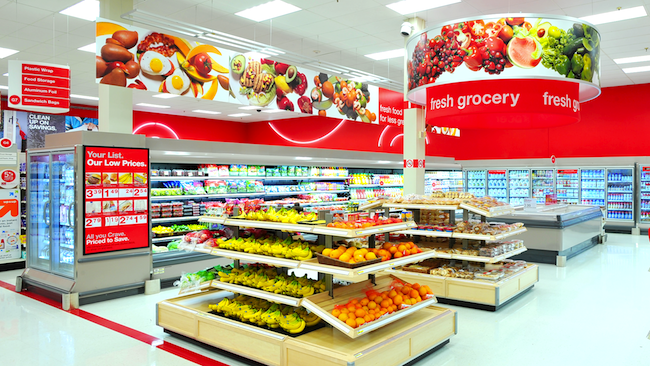 Today, even more Target stores offer an expanded selection of fresh food, allowing guests to get more done in one store. “The beauty of Target is that our guests can pick up a designer dress and a carton of milk at the same time!” says Tina. The design of the fresh grocery area is often distinguished from other departments, and it strategically features wood surfaces for a more natural feel. It entices guests to feel at home and ready to whip up a delicious meal. Without great customer service, a beautifully designed store and trend-right merchandise means nothing.